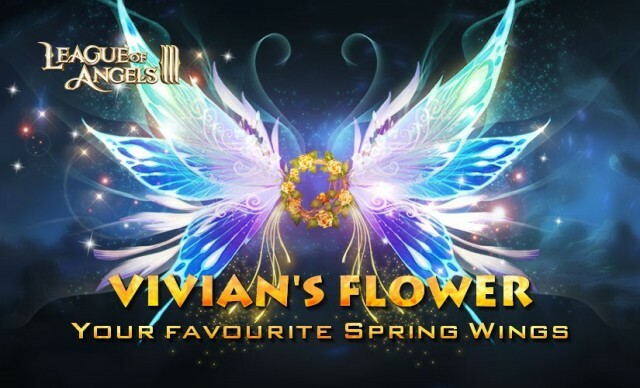 Vivian’s Flower, a brand new pair of wings is coming at Angels Carnival! Made by shinning flower, Vivian’s Flower is the symbol of spring and lucky. Once you unlock Vivian’s Flower, it could bring you over 80K BR and a perfect new look to match up your hero’s Outfits. Don’t miss the chance to unlock the party exclusive items before the event ends! 1. You could directly purchase Vivian’s Flower Sigil (permanent) in Event. 2. When you meet some certain requirements, you could purchase Vivian’s Flower Sigil (permanent) with great discounts! >>Good news for VIP0 players: Login for 5 days, you could get Djembe, Vivian’s Flower Sigil (3 days) and other rewards for totally FREE! >> You could increase your BR over 80K by unlock Vivian’s Flower and grant massive bonus HP (+36K), ATK (+10K), DEF (+7K). >> During the party time, you could use Brilliant Feather or Topaz to spin the machine and win the extra Diamonds and Djembe. >> Moreover, using Prize x5 will automatically multiple all prizes by x5 (you can earn x25 prizes if you also get x5 in the last column)! Next: The best chance to get Dragonslayer!